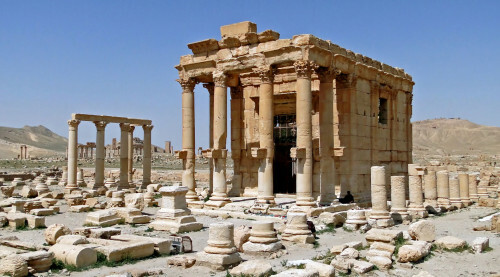 The Islamic State has blown up a Roman shrine in Palmyra in central Syria, according to the Syrian Head of Antiquities. The inner area of the temple was destroyed and surrounding columns collapsed, Abdulkarim said. Residents also spoke of Islamic State destruction, but said the detonations took place last month. Baal Shamin was built in 17 AD and grew during the reign of Roman emperor Hadrian in 130 AD. The Islamic State captured Palmyra, a famed oasis during the Roman era and for caravans on the Silk Road, in late May. The militants threatened to destroy the historic ruins as “idolatry”; however, until the weekend, reports of damage had been confined to some tombs outside the Roman district and some museum pieces, including the Lion Statue of Athena. Last week the militants beheaded the 82-year director of antiquities in Palmyra, Khaled al-Asaad, and displayed his body on an ancient column — which al-Asaad had reportedly restored — in a city square.